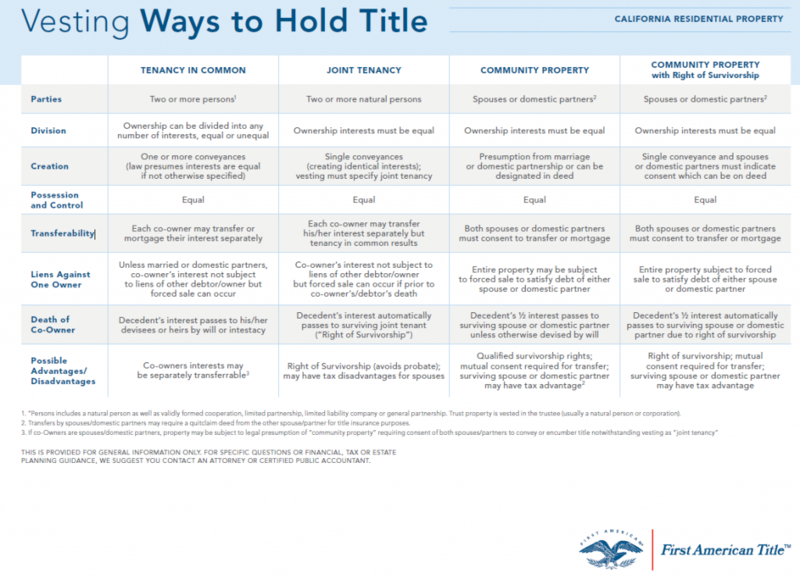 Vesting Ways to Hold Title - Knowledge Base - Resources - Allied Commercial Real Estate, Inc.
1. “Persons includes a natural person as well as validly formed cooperation, limited partnership, limited liability company or general partnership. Trust property is vested in the trustee (usually a natural person or corporation). 2. Transfers by spouses/domestic partners may require a quitclaim deed from the other spouse/partner for title insurance purposes. PLANNING GUIDANCE, WE SUGGEST YOU CONTACT AN ATTORNEY OR CERTIFIED PUBLIC ACCOUNTANT.